The numbers are staggering: 70 to 80% of people are affected at some point by acne. We all know people who have suffered, or are presently suffering, from it. You may think acne is confined to teenagers – but that is incorrect. Acne can affect teenagers and adults. If you are wondering what causes acne, the answer is complex. Stress is a major cause; but acne can also result from hormonal changes related to puberty, the menstrual cycle, pregnancy, and birth control. Greasy lotions, cleansers and cosmetics. Profuse sweating and high humidity. Scientific research has repeatedly dispelled certain myths about acne. Myths such as: acne is caused by eating chocolate, nuts, greasy foods, milk products and foods with a high glycemic index. Or the myth that not washing often enough causes acne. acne that produces painful cysts in addition to regular inflamed pustules. Anyone who has ever suffered from acne will confirm that it is, indeed, a cause of emotional distress. And when the condition is as severe as cystic acne, the emotional pain can be extreme. It is also important to note that scarring is more likely to result if acne goes untreated. So don’t ignore it … control it! MD has developed a collection of products that have been clinically proven to be highly effective in helping you control acne. The images below profile a patient who suffered an extreme case of cystic acne. They say a picture is worth a thousand words … just look at this life-changing transformation! 1. The first step was to undergo a professional peel and Retin A treatment (administered by physician or medical skin specialist). 2. After five days, the patient continued her treatment with the MD Complexion Factor Starter Kit (including the MD Exfoliating Cleanser, MD Seaweed Gel Moisturizer, and the MD Acne and Scar Cream). 3. Once the inflammation had calmed, MD Vitamin C Serum was applied every evening (while still using the 3-step Complexion Factor products in the morning). 4. When the skin appeared healthy, the patient added MD bleaching cream to her daily routine. 5. During treatment, MD Ultimate Green was added to minimize inflammation and M redness. The entire treatment was completed in six weeks. For severe cystic acne or stubborn hormonal outbreaks, adding MD Nutri Hair supplements is recommended because it will quickly address hormonal issues commonly found in skin of both hair loss and acne sufferers. One should notice the cessation of new cystic acne breakouts and the reduction of oily skin within days of starting the natural supplement. 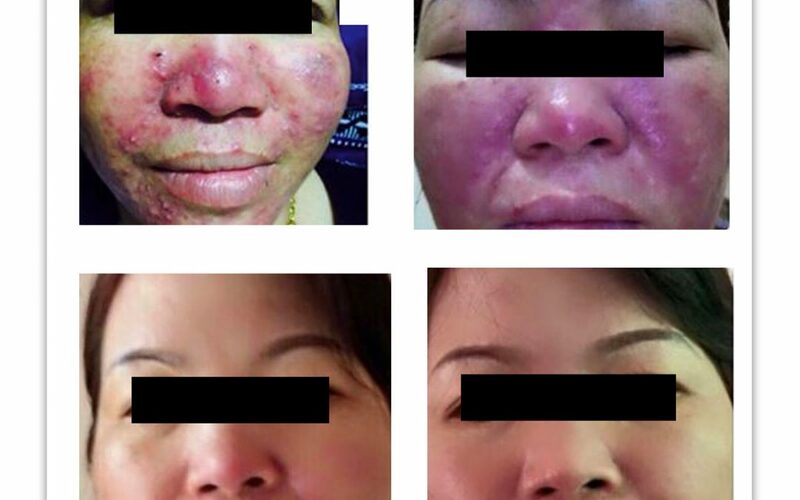 We would like to extend our sincere thanks to Mr. Minh Nguyenhoang for providing us with the photos of the patient and details of this MD success story. Mr. Minh developed this treatment that he calls “Biocellular transformation”. Minh Nguyenhoang is a medically trained skin specialist. Obtain clear skin, the MD Complexion Factor way! With our three-step kit, clearing up acne has never been easier! Keep pores clear and skin smooth with the gentle Exfoliating Cleanser. Hydrate and balance oily skin with the cooling Seaweed Gel Moisturizer. Spot treat problem areas with proven acne fighters in the Acne and Scar Cream. This lightweight serum penetrates deep into the skin to help support collagen production, increase skin firmness and elasticity and minimize the appearance of fine lines and wrinkles while repairing and preventing sun damage. Vitamin C is considered to be a powerful antioxidant that provides natural protection from UV rays and infrared radiation. This water-based serum glides on easily, and unlike other Vitamin C products, retains its potency because it remains clear and does not turn yellow for one year after opening. It’s formulated to boost radiance and improve skin texture with 20% of L-ascorbic acid (the most active, stabilized form of Vitamin C) to protect skin from environmental age accelerators and is considered by many scientists as the gold standard for anti-aging. This must-have serum delivers a firm, supple, and luminous complexion over time. MD Ultimate Green is a daily supplement containing enzymes from a rich array of organically grown terrestrial plants that are skillfully blended with aquatic plant forms to provide extra health benefits. These supplements are like a “superfood” for healthy, glowing, younger-looking skin. MD Nutri Hair is a supplement that was designed specifically for hair breakage and excess shedding … but it also addresses hormonal issues commonly found in skin of both hair loss and acne sufferers. One should notice the cessation of new acne breakouts and the reduction of oily skin within days of starting the natural supplement.